South Korea warned that North Korea was likely to launch “provocations” if Seoul did not meet a Saturday deadline to cease propaganda broadcasts as tensions heightened on the divided peninsula Friday. South Korean Defense Minister Han Min-koo issued the warning at a press conference as a South Korean media outlet reported that Pyongyang appeared to be preparing to test-fire short- and mid-range ballistic missiles. The report by Yonhap News Agency cited a South Korean government source who said that North Korea seemed to be “weighing the timing of the firing under its strategic intention to increase military tension on the Korean Peninsula to the highest level.” The source also said that the apparent preparations for the test had been detected by South Korea’s joint radar system, which it shares with the United States. Earlier Friday, North Korean leader Kim Jong-un declared his country to be in a “quasi-state of war”and be fully ready for any military operations starting Friday evening, according to a report by Pyongyang’s official Korean Central News Agency. In response, South Korea raised its military readiness to its highest level. Joint Chiefs of Staff spokesman Jeon Ha-kyu told a televised news conference that South Korea is ready to repel any additional provocation. The North has also given Seoul a deadline of 5 p.m. Saturday evening (4 a.m. EDT) to remove border loudspeakers that, after a lull of 11 years, have started broadcasting anti-Pyongyang propaganda. 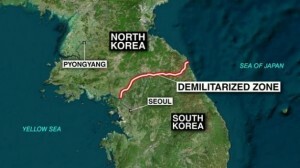 Failure, Pyongyang says, will result in further military action. Seoul has vowed to continue the broadcasts.